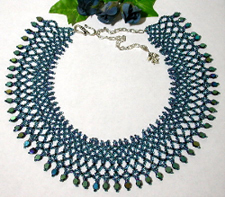 This impressive netted seed bead collar is nearly two fabulous inches wide. The 16 inch length is adjustable to 22 inches with the added extender chain. EASY!